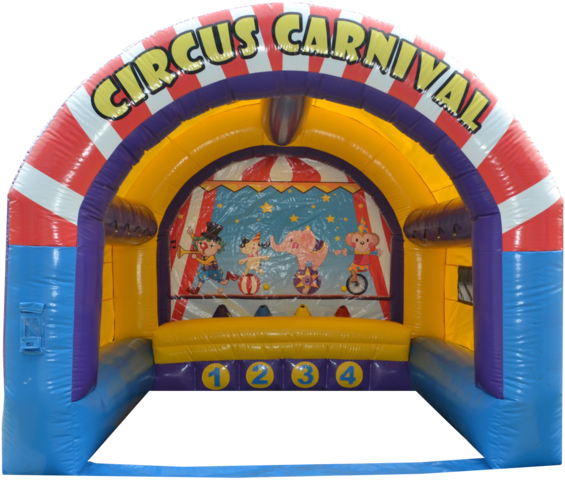 Our Circus Carnival game is an awesome interactive game that will test your throwing abilities. Great carnival game for summer barbecue parties to birthday celebrations and graduations, and a great way to promote family entertaiment, one of the classic carnival games. Add interactive games to your event, and high traffic units such as obstacle courses and inflatable slides and the sky will be the limit! Our circus carnival game rental comes with an assortment of 12 (5" to 6") plush animals to be given as a prize. Please note that we show a picture for reference only, the design on the plush animals may change, as is an ASSORTMENT, and depends on availability.